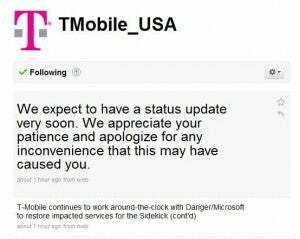 Apparently, every T-Mobile Sidekick user from sea to shining sea has been without data access on their mobiles this weekend. Unfortunately, word on the wire is access should have returned yesterday (but it didn't). How do we know this outage is serious business? Because it's a trending topic on Twitter right now, that's how. Celebrity blogger Perez Hilton, a Sidekick aficionado, is also on the warpath over this today, but in T-Mobile's defense we've learned from his frantic blogging that the carrier issued he (and others) bill credits ranging from $35 to three full months of data access. While we anticipate a significant portion of data services to be restored by Monday, some richer data services may lag. We sincerely apologize for the inconvenience, and appreciate your patience as we work hard with Danger/Microsoft to resolve this issue. We will continue to keep you updated as we have news to share. Thank you."